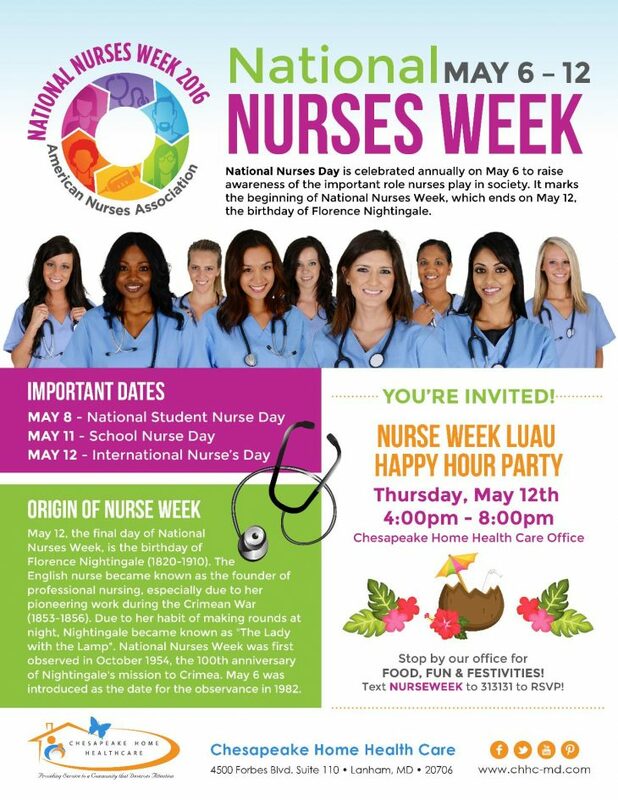 LANHAM, Maryland – The administrators at Chesapeake Home Health Care (CHHC-MD) are offering a “Luau Happy Hour” for their nurses and nurses in the community to show their appreciation. The celebration is timed to coincide with National Nurses Week, which begins on May 6th. National Nurses Week is celebrated annually to raise awareness of the vital role that nurses play in society. The theme of this year’s National Nurses Week is “Culture of Safety”, and so the Clinical Department at CHHC-MD is planning on doing a mini workshop on safety at the beginning of the event. The Clinical and Scheduling Department will be giving away fun awards and certificates like, the “Champagne Award” for the most sparkling personality as well as other awards that pertain to nursing. There will be a prize wheel that includes a raffle of gift cards to local restaurants, movies, etc. Each CHHC nurse will be given an iPad folio and a Nurses Week Certificate. There will also be a hula hoop contest held. On the menu at the Luau will be an assortment of happy hour small plate dishes, shrimp, and tropical beverages. The office will be decked out in a Hawaiian theme, and each attendee will receive a lei. The event will be held on Thursday, May 12th (founder of professional nursing Florence Nightingale’s birthday) from 4 pm to 8 pm at the Chesapeake Health Home Care office, 4500 Forbes Blvd, Suite 110 in Lanham, Maryland. Care. It’s the philosophy at CHESAPEAKE HOME HEALTH CARE INC. (CHHC-MD). Whether it’s providing hands-on care for loved ones; getting connected to additional wraparound services; or helping to further attain professional education to becoming a better caregiver – caring is not just a job at CHESAPEAKE, “it’s our passion and our purpose”. As a premiere, licensed Maryland home health care organization, CHESAPEAKE HOME HEALTH CARE INC. (CHHC-MD) specializes in coupling innovation with community-based services to meet the specific needs of medically fragile or special needs children and nursing-dependent adults. And by focusing exclusively on this often misunderstood and overlooked population, CHESAPEAKE has established itself as a proven leader in the community and healthcare industry. So let CHESAPEAKE HOME HEALTH CARE INC. take care of you. Let’s get started! For more Information, visit http://www.chhc-md.com/.